I made a quilt from a pattern by my quilting idol: Sarah Fielke. I can honestly say that this is my favorite quilt that I have made this year. I came up with my own unique design to create this sentimental mini. It is also one of my favorites from 2011. It is almost all done by hand and honestly took a lot longer than some of the big quilts I have completed. examples include a table runner, a skirt, patchwork sleepsack, bags, etc. It's been a very productive year. Other sewing highlights include attending Houston Quilt Market and becoming the president of the Boston Modern Quilt Guild. Thanks for following my sewing journey this year - everyone's support and encouragement means a lot! I finally found some time to get back to sewing today. I quilted the purple Stamps quilt. I am going to put minkee-like fabric on the back soon. Here's most of the fabric goodies that I received for Christmas. My favorite one is on the far left from the Timeless Treasures "Bright Lights Big City" collection. I have immediate plans for the Taza pink Tarika fabric (2nd from left) and the rest will go into my stash. Nick also spoiled me with some new sewing notions. I have decided to make the transition to cotton thread this year. Sarah Fielke insists on it and my good friend Alice also recommends it. It turns out my local Joann's actually carries Gutermann 100% cotton AND it's even cheaper than the polyester Gutermann. I honestly was beginning to wonder if I would ever complete this quilt. Choosing the fabrics (all from my stash) was a breeze and even the cutting and sewing of the top took me about a week. The real time eater was quilting the huge thing! I decided I was going to save some money and not rent time on the long arm to finish it - I wish I had just spent the $50! But instead, I decided to quilt it at home using straight lines and the edge of my walking foot as a guide = about 1/4" to 3/8" apart! It turned into some very dense quilting. I started doing this in the beginning of October and barely finish it about a week ago. Throughout this past fall, I had to force myself to work on it - making myself do a column a day. Each column required more than a full bobbin's worth of thread. I ran into a major problem when I had about 13 columns left: the top wasn't as tightly basted to the batting and backing - so I had to rebaste it twice (the first time, I didn't do it right and ended up spending an inordinate amount of time with the seam ripper!). Enough of my sob story about this headache! I will say that I am very happy with hot it came out and the straight line quilting does look pretty good - adding a whole new element to the project. The whole quilt is quite a departure from what I normally do - using a lot of neutrals is not very common in my work. The quilt measures about 90" x 108" or so. I bound it in the perfect Moda bliss white on red dot and backed it in some Prince Charming baby paisley. It contains many of my favorite fabrics: KJR ribbon flower, AMH Cathedral in dusk, Her Crusier (red bike fabric) for Avalon, and Park Slope leaf dot. 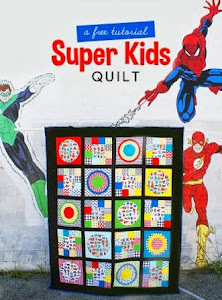 I based the quilt design on the famous Strips and Brick pattern by Malka Dubrawsky. This will probably be my last finish of 2011. My 2 year old hasn't slept through the night for the past 5 days and hasn't had a proper nap in that time period either. Dealing with this at nearly 8 months pregnant has been unbearable! I will finish the year out with some 2011 wrap-up posts as well as sharing some pictures of some fabric goodies I received for Christmas. I hope everyone is doing well and enjoying the holidays! It is made from an old quilt and she machine embroidered family names on the back. I love handmade gifts and am grateful that Gregory now has such a nice family keepsake. Tonight I finally was able to give these two quilts to a dear friend who just had her second little girl. Gregory is great friends with her first daughter - and when I found out my friend was pregnant again - I told her I wanted to make the baby a quilt. Of course, I had to go ahead and surprise her by making a quilt for her oldest too . Don't they coordinate nicely? She was quite pleased with them and I enjoyed making two girly quilts :) I did blog about these quilts previously but I hadn't revealed their real story in case she came across my secret plan. This quilt was begun almost exactly two years ago by my good friends who participated in the Boston Modern Quilt Guild bee block exchange. I finally finished it this past weekend! It took me about one week to do this jagged/puzzle piece type of straight line quilting. I used my walking foot and simply started at the top of the quilt and moved the quilt around to create a geometric/boxy random type of pattern. It was a little tedious sometimes but worth it I think. Participants in the Flickr Hip to Bee Square group also contributed to this quilt. I also ended up making several myself, in order to have a 5 x 5 layout. I backed and bound this quilt with some Urban Garden fabric I've had in my stash for a while. A big thanks to all those who contributed blocks for this quilt! I am so pleased to have this finished and it's a great size for lounging under on the couch. Anyway, lots of Christmas/holiday parties going on lately and last night I brought this patchwork fabric basket made from this infamous tutorial by Pink Penguin. I came home from Quilt Market with 5 mini charm packs of various collections and it's fun to use these small 2.5" squares on various projects. This basket features Moda's California Girl, linen, some Urban Garden, and a little Neptune. The gift was for a "Yankee Swap" style gift exchange and thankfully it was in demand (it would've been mortifying if it was viewed to be more of a 'white elephant' item). It even resulted in two people asking me if they could pay me to make similar items. Unfortunately, I am pretty sure I did the handles wrong - it looks more like a bag than a basket. Oh well. I have finally started quilting my Mod Mosaic quilt - I am a little over half way done. I am off to the year's last BMQG meeting for the Kitchen Goods Swap reveal this afternoon- can't wait to see what my partner Jane came up with my fabrics as well as give Alice her gift. I couldn't do much yesterday after exhausting myself with the long-arm - so I watched Babe with my 2 year old and after he went to bed, Nick and I watched 3 episodes of Alias. Lots of TV watching while I hand sewed the binding down on this quilt: I started this quilt in June and it feels like it has taken me forever to finish it - but I know that 5-6 months isn't that bad. I had wanted to challenge myself by making lots of pieced blocks - 21 pieces per block makes for a lot of sewing. The pattern I used, Bird Bath, came from Elizabeth Hartman's The Practical Guide to Patchwork: New Basics for the Modern Quiltmaker. 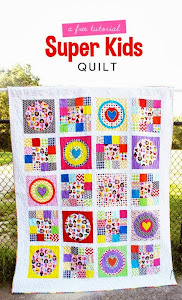 I can't recommend this book enough as well has her blog - it seems like I do a lot of her patterns and tutorials. I made the process of this quilt extra tedious because of my choices to fussy cut the center blocks and using over 100 different fabrics from my stash - every block is unique. I rented time at a long arm quilting studio to stipple the quilt in light pink variegated thread. I backed the quilt in the grey scooter Sherbet Pips print and added several inches of a Henry Glass print to the top and bottom of the backing piece. I bound the quilt in a SP scarf print. If you look carefully at this picture, you can see the seam line for joining the two large backing pieces. I didn't do this on purpose, but I think it's hilarious that the brunette and blonde scooter boy are joined almost perfectly in several spots, making him look like he has a very interesting hair dye job. I love this quilt and I am keeping it for myself. It will probably be a while before I take on another project like this that requires such a significant time commitment. I did get pretty tired of working on it along the way! Standing at a long arm machine for 3+ hours at 6 months pregnant was not an easy task today. I am so glad I decided to do the quickest kind of quilting I know how to do: stippling. I am bored of stippling but I didn't have many other options if I didn't want to stand for much longer. I am binding it tonight and will enjoy the easy task of the hand sewing while I am sitting down!